I was in between hostel stays and decided to treat myself to a hotel for the night. This room was exactly what I needed: clean, spartan, and well-located. Perfect for a solo traveler en route to the airport or another city. Hostel world allowed me to book a 3 person room for four people so when we arrived I had to get another room, the receptionist was kind enough to call the manager and get me discounted price. they were helpful with finding restaurants and called us a cab. very clean and comfortable place. good location. Nice hotel style private rooms. 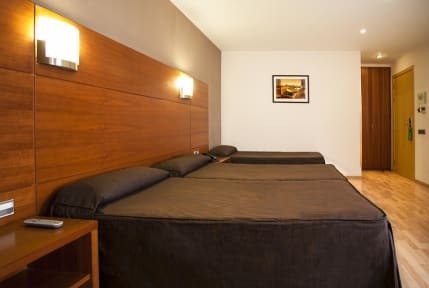 Very clean rooms, comfortable beds, nice staff & in a very safe neighborhood next to the Gracia and Eixample neighborhoods of Barcelona. We loved staying here and it was a nice location. We slept well and were able to easily get to all of things we wanted to do in Barcelona. Maybe not for the younger travelers looking for a hostel or social hangout, but perfect for those looking for a quiet, safe night to sleep. We will definitely go back there. Staff were super helpful! Rooms were basic but nice (it is a 2-star hotel). There was a terrace on the 9th floor, which was an unexpected and pleasant surprise! Easy to get around Barcelona with the Gracia transit stop so close. The location was great once we worked out where we were in relationship to the the stuff we wanted to do. The staff were some of the best we had in Europe for helpfulness and patience. Nothing was a problem. A bit noisy at night with some sort of machine ( rubbish collecting?) outside but I’m from a really quiet rural place so if you are from a city it’s probably normal. Only thing missing was coffee making facilities in room. Easy to find. We rested well.